3 BEDROOMS, 2 RECEPTIONS, CONSERVATORY, Refitted Kitchen & Wet Room, Cloakroom, Driveway, Parking & Garage, Front & West facing rear Gardens, Gas CH, Double Glazing, Sought after location A modern detached bungalow situated in the popular village of bungalow at the head of this cul-de-sac with good size west facing gardens to rear. The property enjoys gas central heating, UPVC double glazed widows, Pvc fascias and soffits together with refitted kitchen, wet room and cloakroom, driveway, parking and garage. Wingard Close is situated on the level close to the heart of the popular village of Uphill which offers a range of facilities including shops, village hall, church, park, primary school, pubs and many fine walks on Uphill hill and access to the sea front. 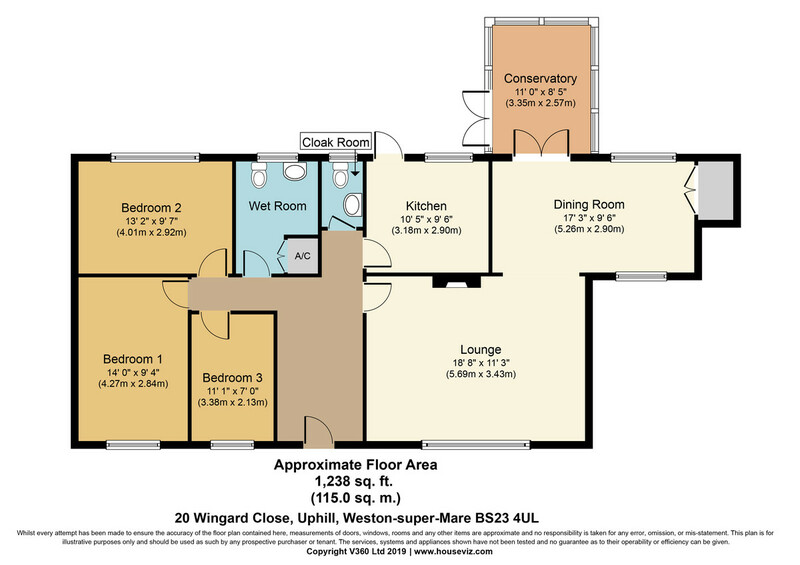 Weston town centre is approximately 1.5 miles distant and affords a more comprehensive range of all year round facilities. The M5 motorway and A38 ensure ease of access to most other parts of the country. ENTRANCE HALL Radiator, timber flooring, loft access with pull-down ladder, telephone point and doors to al principle rooms. CONSERVATORY/SUN ROOM 11' 0" x 8' 5" (3.35m x 2.57m) From frame to frame, UPVC double glazed windows to three wides enjoying views over the garden and southerly views toward the hill and church, UPVC double glazed double doors leading into the rear garden, light and power. KITCHEN 10' 5" x 9' 6" (3.18m x 2.9m) Refitted with a range of modern units with laminate Caldeira worktops and matching splashbacks over, inset sink unit with matching drainer and chrome mixer tap, range of base cupboards with pull out/slide out corner units, range of matching wall cupboards, NEFF single electric oven and combination oven/microwave/grill, NEFF induction hob with extractor hood over, space and plumbing for dishwasher and washing machine, space for upright fridge/freezer, coved ceiling, spotlighting, radiator, click laminate flooring, UPVC double glazed window and door into the rear garden. BEDROOM 1 14' 0" x 9' 4" (4.27m x 2.84m) Including built-in double wardrobe, coved ceiling, radiator, TV point, telephone point and UPVC double glazed window to front. BEDROOM 2 13' 2" x 9' 7" (4.01m x 2.92m) Coved ceiling, radiator and UPVC double glazed window to rear. REFITTED WET ROOM 9' 1" x 6' 9" (2.77m x 2.06m) Built-in shower with drencher head and hand shower, pedestal wash hand basin with mixer tap, low-level WC, chrome ladder style radiator, fully tiled walls, tiled flooring, UPVC double glazed windows to rear. Doors to built-in boiler cupboard housing the gas fired combination boiler. CLOAKROOM Low-level WC, wash hand basin with tiled splashback, UPVC obscure double glazed window to rear. OUTSIDE The property is located at the head of this cul-de-sac with front garden laid to level lawn, concrete pathway to entrance, chipping stone borders and rose border. Part shared concrete driveway leading to own parking space in front of garage. GARAGE 18' 10" x 9' 8" (5.74m x 2.95m) Electrically operated up-and-over door, light, power, door to side garden and timber single glazed window overlooking the rear garden. There is a gate between the garage and bungalow allowing access to the rear garden. To the south side of the bungalow is a fixed timber panel. REAR GARDEN Good size garden predominantly laid to level lawn with westerly aspect and south views toward the hill and church, there are mature flower and shrub borders, trees, timber garden shed and greenhouse. To the side of the garage is a water tap and outside lighting.